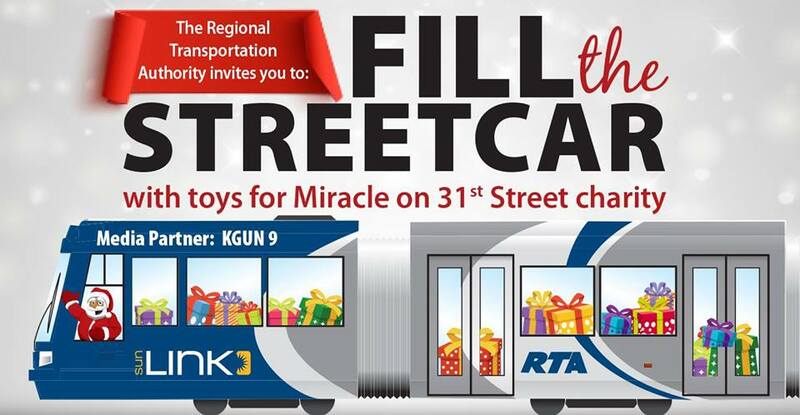 The Regional Transportation Authority invites you to be a part of the joy of collecting toys for Ramon’s Miracle on 31st Street, a legendary grassroots charity that provides holiday kindness to economically disadvantaged children in the Tucson metropolitan region. Now in its 48th year, the open-door Christmas celebration led by charity founder Ramon Gonzales, a retired sheet-metal worker, is attended by thousands of children and their families. This year, more than 15,000 children are expected to attend the celebration. The RTA invites you to join together with others in our community to ensure that each of those children leaves with a new toy in hand. Please help us reach our goal of collecting 1,200 toys this year! – Visits from Santa Claus…and the Grinch! On Friday, Dec. 14, between 9 a.m. and 6 p.m., just bring your new, unwrapped toys to the Sun Link streetcar that will be stationed just west of 4th Avenue on 8th Street in downtown Tucson. ​Volunteers from the RTA will be there to greet you and load your toys onto the streetcar. You can opt to do a curbside drop-off or join us at the location for live local entertainment and a chance to see Santa Claus and the Grinch.